Our bodies can do without water for a short time. Deprived of H2O, dehydration takes over, we dry up, then die. Down through the ages, if you put it in a nutshell, the way we gathered water is a bit of a misnomer. Today most of the population drinks bottled water. Not so many years ago, I would have laughed had someone told me I would be paying for it. The funny thing about this is, when I tested my tap water against the brand of bottled water we were drinking at the time, the tap water tested superior to the bottled water and by a significant difference. I even wrote a novel, Rising Tide, about a world inundated by water. There was land available but it was definitely at a premium. What it boils down to (no pun intended), is there’s water everywhere–in the ground, the air, oceans, rivers, streams, creeks, mud puddles and pretty much anywhere you can think of (except the arctic which is actually the most arid place on earth with deserts running a close second). So the next time you pick up that cool, clear glass of water, be thankful you’re not drinking from a municipal source a hundred years ago. Once I completed and published my first novel, Rising Tide, I decided the ending left a question the reader could use their imagination to determine. This would leave an air of mystique surrounding the book’s conclusion and therefore, not be a good candidate for a sequel. After being asked if there would be a follow-up to Rising Tide, I was hit with “A light bulb moment.” It took four months to complete the rough draft of book two titled, Eden’s Wake. Without a break, I began the first re-write. It went fairly well, but I knew I needed some time away from the book. I obeyed my “time away” inclination and turned to work on other projects. Needless to say, this new path didn’t last long and I found myself working on Eden’s Wake’s third re-write. After completing this stage of what was becoming the abyss known as Eden’s Wake, I began to pen the third book in the series, Deadly Reign. The new manuscript went surprisingly well and I found myself pleased with the first draft. From time to time I would delve into my dark side for a good dose of self-abuse and pull out Eden’s Wake for yet another re-write. 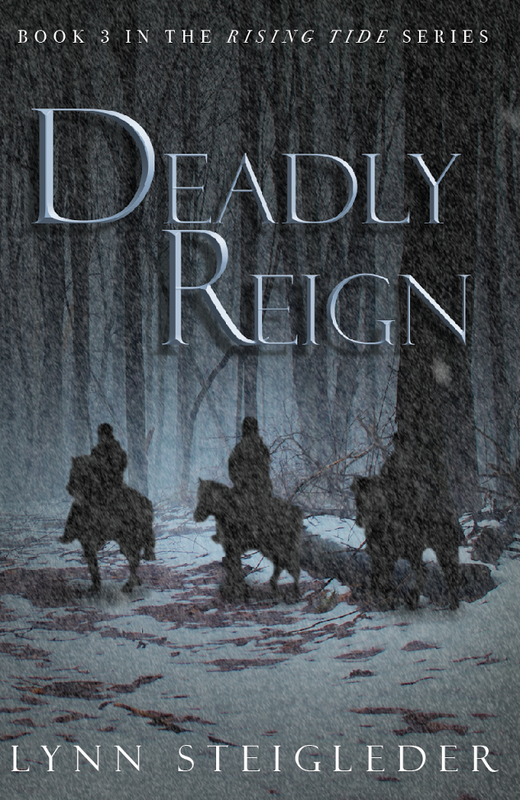 During this time of back and forth I completed Deadly Reign, including re-writes. I was satisfied the third manuscript in the series was ready for submission; however, (and this is important) when you are writing a series, the books are normally numbered 1,2,3 and so on; therefore, you can see my conundrum. After another re-write or two with my parasitic twin, Eden’s Wake, I began a stand-alone science fiction manuscript titled, Terminal Core. As I wrote this new offering, I continued to work on Eden’s Wake. I finally made a decision that surprised even me. Being too hardheaded to trash the troublesome manuscript and having invested years, I made major changes. My new mantra was, gut, re-write, gut, re-write. This worked and seven years after Eden’s Wake’s conception, it was published, April 27, 2015 and I was finally satisfied. Rising Tide depicts a world in which land is at a premium due to the advancing sea, where man’s attempt to adapt has led to a decay of morals into survival of the fittest. In the midst of the ocean, a crew of racketeers rescues a stranded diver, Ben Adams. Is the rescue just a fortunate coincidence for Ben, or has he been led to this rendezvous with fate for a common goal? A mysterious island inhabited by a primitive yet advanced race of people. A devious ship captain’s metamorphosis into the essence of evil and a ship’s container discovered by itself in a billion square miles of ocean all play a role in this tale of rebirth for a world corrupted by the collapse of morality. rise. Not that any course was viable had the increase in temperature been detected earlier. Mankind came to the realization he had no control over the climate, for better or for worse. That alone was in God’s hands. Not to say global warming wasn’t real, but there was nothing anyone could have done to prevent it and nothing anyone could do to stop it. two thousand feet above pre-twenty-first-century sea level remained. chain reaction that would further reduce the polar caps. This caused the water level to rise, fueling the vicious cycle until the last remaining vestige of ice was reduced to liquid. After nearly a decade of unrest and political upheaval, established governments and factions alike came to the identical conclusion. Survival depended upon unity. What remained of the human race had finally gotten it right. The scientific community did a respectable job of collecting and processing the massive amount of pollution seeping from sunken cities, refineries, and tank farms. In time, the planet did what man could not and digested the remaining toxins. Travel by road or rail was limited but still possible. A handful of usable airports remained, but with so many waterways, sea-going vessels became the most practical way to transport not only people, but goods and services as well. While the all-consuming need for oil created countless problems for the former world order, a limited need for fossil fuel still remained. One drilling platform remained, simply because it supplied all the crude the world needed. Enter the planet’s last oilrig, the Omega Z, dubbed “OZ” soon after its conception. Maintaining this aquatic city was a constant undertaking. This daunting task fell to a select few. In the second book of the “Rising Tide” series, “Eden’s Wake,” I introduced a new character, “Dalon Con.” He only appeared for a page or two, but was pivotal to the outcome of the book. I found this interesting, as it shows the smallest contribution can have a profound effect on the outcome of any situation. I decided that this act deserved more than a two page mention, barely enough to call an introduction. The only way to remedy this was to give this kind old man a novel to call his own. I put virtual pen to virtual paper several weeks ago. I’m delving into what I would term as virgin territory, “Urban Fantasy.” It doesn’t sound like that much of a stretch since I usually write science fiction and fantasy; however, a small change in genre may influence writing in a major way. It’s going well and I’m enjoying expanding on a character that was first encountered in an eerie wasteland, being the savior for a nearly dead protagonist. In the new book of the same name, “Dalon Con,” he alters his true persona, portraying a thirty something in a violent urban setting. He travels to his wilderness homeland to find his ward the Great One has given him to befriend in this hellish existence. It’s amazing how we connect emotionally with someone who exists only in our mind…but I guess that’s what it’s all about.